Ref. picture #22194 this is an old photograph which I found in Mum's (Rhoda nee Groundwater) stuff. 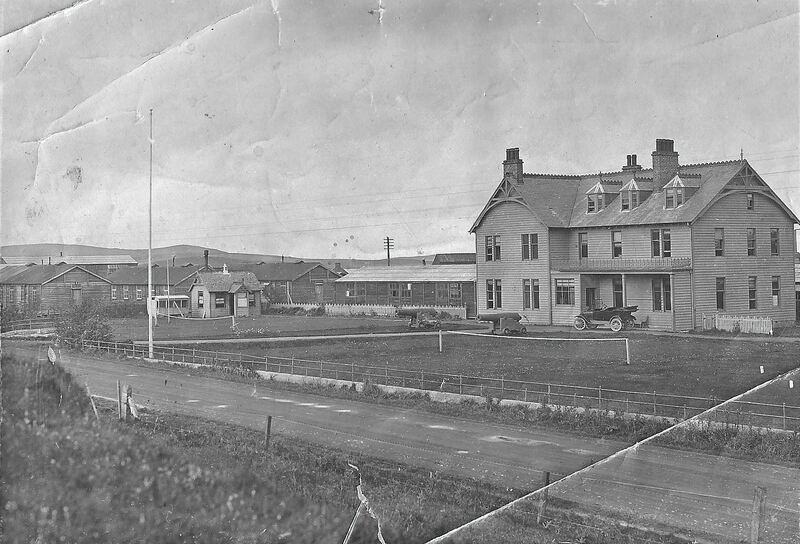 It is the Stenness Hotel and, given the style of car, it must have been taken in about 1920. I do not know the photographer. I have been inside only once, with my grandfather, when I was very peedie and I mind seeing all those big fish in boxes. Very impressed I was. Is that a military camp in the background? During the First World War there was a seaplane base on the south of the Loch of Stenness, just along from the Standing Stones Hotel. There was also a Royal Naval Air Service HQ based at the hotel with an establishment of 198 officers and men. The officers were billeted in the hotel and the other ranks were in the accommodation huts shown in the photograph. They commenced flying on the loch in May 1918 but found the loch to be too shallow and exposed. The flying was moved to the base at Houton and the HQ remained at Stenness.